Begin your Alaska adventure with an overnight in Anchorage and the next day experience a scenic journey from Anchorage to Denali via rail. With two nights at Denali National Park, there’s ample time to experience the abundant wildlife and to visit viewpoints for the "Great One". Enjoy dinner and a show at the Music of Denali Dinner Theater at McKinley Chalet Resort featuring family-style dining and a spirited original musical about the first men to reach the summit of Denali. Enjoy the scenic trip via motor coach to Seward on one of the most scenic byways in America, Turnagain Arm. We'll pick you up at the airport and transfer you to your Anchorage hotel. Experience an optional excursion this afternoon or explore Alaska's largest city on your own. Overnight Anchorage hotel. This morning board our luxury railcars and marvel at the splendor of the spectacular Alaska and Talkeetna ranges as you make your way to Denali National Park. You’ll cross over Hurricane Gulch via one of the Alaska Railroads many engineering marvels, a 296-foot-high bridge. Upon arrival into Denali transfer to your hotel. This afternoon and evening are yours to fill with independent exploration or optional outdoor activities. Overnight Denali-area hotel. 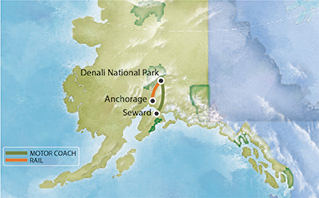 Board a motor coach this morning for you journey to Seward. Enjoy a stopover in Anchorage. See the spectacular scenery as you travel down the Seward Highway, a National Scenic Byway, through the Chugach Mountains along Turnagain Arm. Your vacation in Alaska comes to a close in Seward at roughly 5:45pm.